I met Chris at the Castle Hills market today. He was very informative about MMJC and their products. I will be buying more of the hickory smoked jerky for sure! 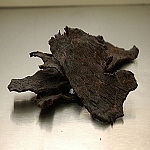 The hickory smoked jerky is the best! Love the flavor.